Want to take my selected memory tour of Greece? Not just the incredible “big” cities like Athens, but the small roads to a different time? I’ve been fortunate to visit this incredible country five or six times in my life and have experienced the changes that occurred since my first trip in 1971. Athens: The Agora, the marketplace so different then and now: Then it was a dirty, dark street with “booths” made of hanging rags and a multitude of variety in the “shops” you would see. Now, the agora is an actual part of the city, with charming, pretty, curvy streets and shops such as the tourist “expects”. The agora was a commercial, political, cultural and religious center for the populace. This area included administrative buildings, temples, public services and courts. Athenians gathered here to buy and sell products, to get informed on current affairs, criticize the government, exchange ideas or just start a conversation. The Parthenon on the Acropolis: Then- the columns of the Parthenon were collapsed and laying in rows. Only a few columns were standing. As years went by, I saw the columns numbered, and reconstruction happening. On my last visit, it was almost completely restored. I was never much a student of history, and didn’t even know there was a Porch of Maidens near the Parthenon; yet its beauty struck me in those early visits and touched me. Stop in a taverna for a shot of Ouzu or Retzina to blend into the land. Dionysus Ancient Theater: On the south aisle of Acropolis, walk Dionysiou Aeropagitou Street and go straight up. Aeschylus, Aristophanes, Euripides and Sophocles, four of the most famous ancient Greek poets, watched their plays being performed for the first time (5th century B.C.) in this theater. The acoustics are incredible; a whisper on that stage can be heard in any of the 17,000 seats! I tested it! First build of wood, during the 1st century BC it was rebuilt in stone, and the stone bench rows are all that remain. Delphi: Just my personal story. After a night of dancing in a taverna in Delphi, my friend Chloe and I were escorted back to our hotel by some very cute Greek guys that we danced with for hours. The time…4am. How were we to know the hotel locked the front door!? And let a doberman loose in the lobby??? The men climbed the balconies to our room, broke into our door, went thru the lobby and locked up the dog, and opened the front door for us. We thanked them and waved goodbye and fell asleep at 5am. The alarm went off at 6! We staggered onto the bus and slept all the way to the next stop. 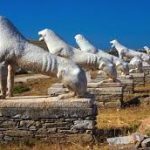 Delos was the birthplace of Apollo and Artemis and boasts the parade of lion statues. Standing before them you can see how erosion has taken its toll reducing them from huge carvings to a small stump in the sand. Examples are now protected in the local museum. 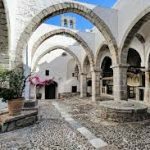 Patmos: Up for a religious adventure? The island of Patmos is one large mountain with a path around it to travel up and down. You learn the meaning of devout prayer when you climb on your donkey, the only way up or down! At the top you’ll see a small monastery where John of Patmos (also called John the Revelator, John the Divine, or John the Theologian) resided. He is considered the author of the Book of Revelation which forms the final chapter of the New Testament. The ride down the mountain is much hairier then the ride up! Mykonos is a picturesque fishing village built around the bay with white washed buildings against a backdrop of the blue, blue waters. Wander these delightful curving streets to see “old” women wearing black, sitting at a window selling their handmade garments. Walk into the open area and find a cobbler who will create a custom made pair of sandals or shoes for you while you wait. This island is a total delight. Olympia: the first ancient Olympic Games can be traced back to 776 BC. They were dedicated to the Olympian gods and were staged on the ancient plains of Olympia. Position yourself to run around the ancient track as a friend sits in the judge’s huge, stone seat to declare the winner. If you are fortunate enough to visit this marvelous country, be sure to cruise the Greek islands for a complete experience!! !